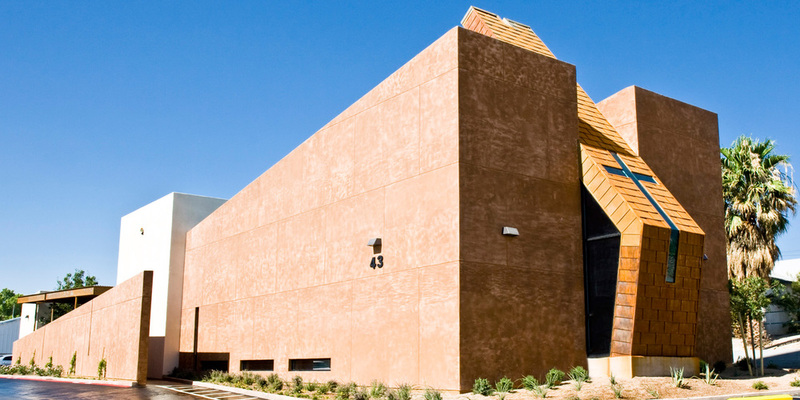 This award winning project is a 5,000-square-foot chapel with a simple, contemporary design. The new Hope Chapel features a sanctuary, small prayer room, library, support facilities, spire and courtyard. The design incorporates a series of angled walls that tenuously slide past each other to create narrow slots which lead into a secluded courtyard. The courtyard provides a transitional space, offering an environment to decompress and prepare to enter the sanctuary. Upon entering the sanctuary, occupants are drawn to the glowing light of the glass cross over the Altar. The interior architecture, furniture placement, and gently rising floor, all lead toward the cross as the sanctuary’s primary focus. To address budget concerns, the gathering space requirements were incorporated into a central courtyard in lieu of an indoor conditioned space. This allowed for a smaller space to climate control and reduced the cost of construction. The firm also rose to the challenge of contending with the harsh exterior surroundings by integrating water features, a screened canopy, and square blocks of synthetic turf situated within concrete in the exterior courtyard. Not only do these elements assist in cooling down the brutal desert heat before the air enters the chapel for natural ventilation, they also mentally prepare visitors before entering a sacred space. Although forward in design, the chapel cannot be viewed from the street. It is intended to create privacy within a dense urban landscape and to focus on the internal needs of the campus. While the chapel was kept simple to accommodate a small budget, the sanctity that was achieved helps its attendees in limitless ways.